Skinny jeans are one of those items that trickled down from their designer beginning, and found themselves in every high street brand around. For some people, this availability is great, and with their slender form they’re able to pull off the somewhat striking look of these controversial jeans. For others however it’s a style that’s more of a hindrance than anything else, and whether they’ve tried it out or never even touched a pair, they’re certain that it’s not for them. The good thing is that jeans come in a whole range of fits, so if the skinny fit isn’t for you, there’s a huge range of other styles you can pick. There is a lot of different jeans you can try out, but there’s no need to focus just on jeans when you’re looking for leg wear options. With the various styles available there are loads of ways to pull off an outfit without going anywhere near those pesky skinny jeans. No matter what you choose to go for, make sure that it all fits correctly. Badly fitting leg wear, whatever the kind, makes the skinny look skeletal, the beefy look obese and everyone in between just look badly dressed; when Wear Skinny Jeans! The most casual leg wear around, joggers. Now these things have been through the wringer and have had a various changes made to them over the years. Loved by some, and hated by others, joggers are great for when you want to keep things casual, but still want something you can wear outside. They now come in various shapes, from slim fit to more relaxed, and in a range of colours and patterns. 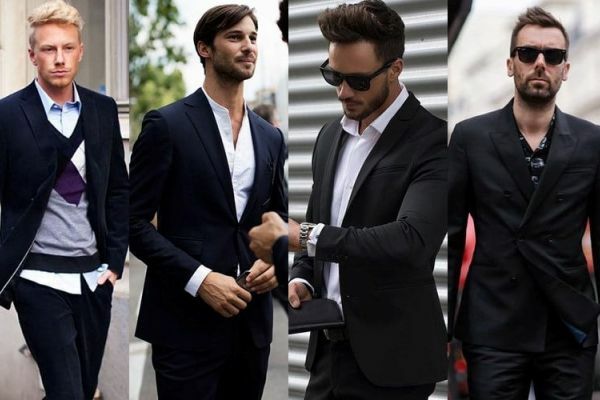 Although these aren’t recommended for formal affairs, joggers can actually go with a variety of outfits, and are perfect paired with T-shirts and short sleeved shirts. You can go for a simple mono-tone outfit with a pair of black joggers with a slim fit white T-shirt and white plimsolls. Keeping the look sleek and put together but with a casual edge. Go for a lighter look with a patterned button up shirt and a pair of grey joggers, matched with some black loafers to pull the outfit together and keep a relaxed and easy feel. The thick material and fitted design will keep the joggers looking less casual and give you a modern and put together look. If you’re dressing patterned joggers keep the top half a block colour and let your joggers be the main focus of the outfit. Trainers are always a good option to pair with joggers. But, like the top, remember to keep it neutral and un-patterned so as to avoid clashing. Comfortable, stylish and with the ability to be dressed up and down – chinos are a versatile item that’s usually made from twill or thick cotton, and comes in a range of fits and colours. Chinos are a good choice if you want the comfort of jeans but with even more versatility. Because chinos can be worn in formal and casual occasions they can be paired with a range of items, and can effortlessly combine comfort and style. A pair of black chinos is good for a smart look, and you can easily pair them with a white button up shirt, and finish with a pair of lace up chukka boots. Keep the colours neutral if you want a formal vibe, and stick to slim fit designs, both in the shirt and chino department. A preppy look is easily achieved with a light coloured pair of chinos, matched with a light blue shirt and some brown leather loafers. The relaxed fit of the chinos will keep the look understated, and the light colours will provide a clean, casual vibe. For something a little bolder, try a pair of chinos in an eye-catching colour like red. You can match this with a complex patterned top, or keep it simple with a basic black T-shirt. Finish off with some lace up boots for an alternative twist. It can be difficult to work out the exact difference between chinos and trousers! and the short answer is that on the whole, trousers are more formal than chinos; and, with their more tailored design, are generally suited to smarter looks. Despite that, trousers have been re-designed and experimented with over the years, and there are many that have a unique mix of traditional and modern styles. For a straight leg or slightly tapered trouser, keep things slim fit and feel free to mix a little bit of casual wear with the more formal style. Try a preppy look with a fitted polo-shirt and tone down the look with some white plimsolls. For a more traditional, formal look that’s good for the office, pick a pair of trousers that are higher waisted so you can easily tuck in a white oxford shirt into them, and then match that with some lace up brogues. 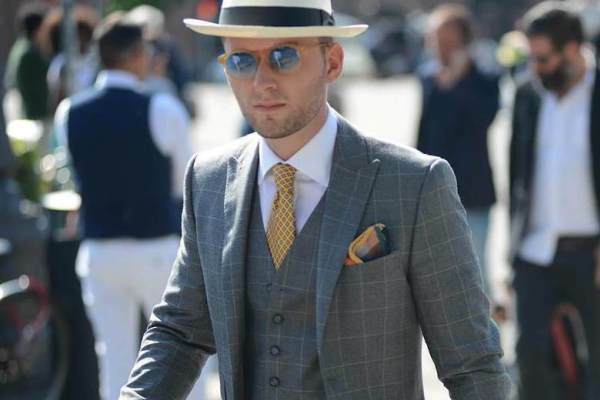 The look will be smart and fitted, complimenting any shape and giving a streamlined appearance. For something that’s a little different, pick some trousers in a noticeable design or colour and merge the formal and casual look together. If the trousers are noticeably tailored, pair it with a basic roll neck to keep the look understated, and finish with some lace up boots. Shorts are one of those items that can cause the room to divide. Some people are perfectly happy with wearing them. while others think that they should only be worn by those under ten. If you’re steering more towards the socially acceptable! then shorts are a good leg wear option, especially when the weather gets a little warmer. The standard rule is to make sure they reach your knee, and don’t go any longer or shorter. Although they’re an item for casual wear! some shorts come in a tailored design and can be worn with smarter looking shirts for a preppy vibe. A casual classic that never goes out of fashion when the summer hits is a pair of light denim shorts. They can be matched with a white sleeveless shirt and brogues; a striped T-shirt and plimsolls, or any other combination that gives a warm, beachy vibe. You can aim for a smarter look when you have tailored, chino shorts, especially if they’re in a dark colour. Pick a slim line button up shirt to tuck into your shorts. 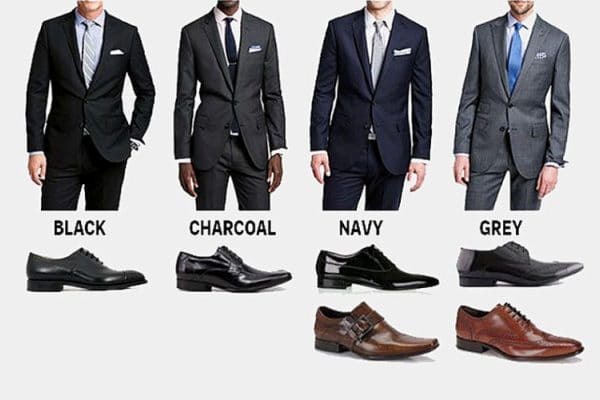 Or leave hanging loose, and finish off with some light weight loafers. Twill shorts give a clean, slim look and can be paired more casually than tailored shorts. But with the same finished look. Pair with a well fitted T-shirt in a simple pattern, then finish with some lace up plimsolls. Slim fit jeans – A fitted but more relaxed alternative to skinny jeans. Tapered jeans – Fitted more towards the bottom. Roll them up for a seriously cool appearance. Chinos – A cross-over between jeans and trousers, chinos are a sleeker alternative to skinny jeans. 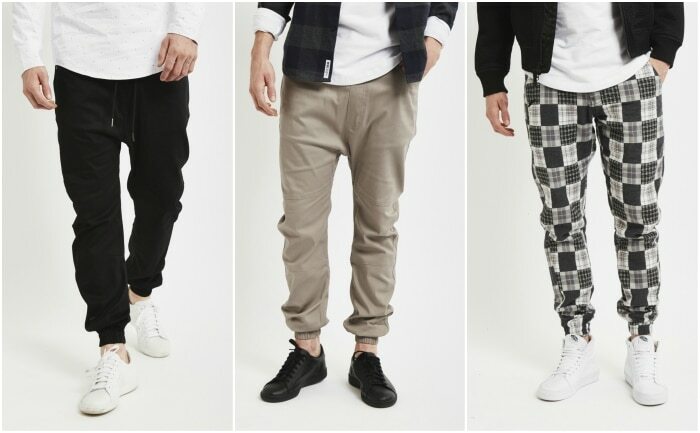 Joggers – For lazy Sundays or simply dressing down, joggers are perfect for a comfortable outfit. 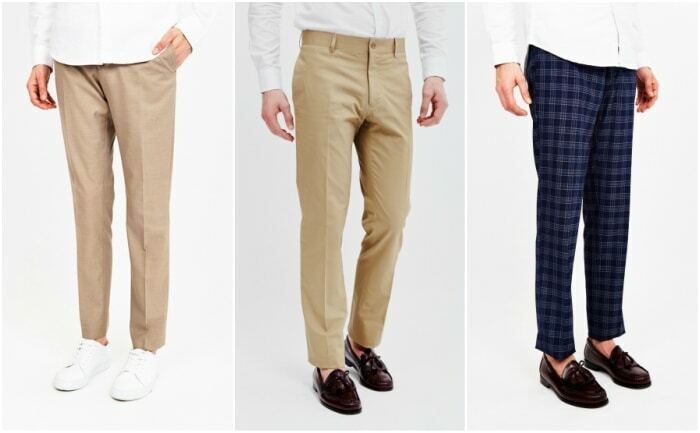 Trousers – For more formal occasions, trousers are a great alternative to jeans in general. Shorts – Warmer out? Put down the jeans and throw on your favourite pair of shorts. If you’re not the right build for skinny jeans, or you just hate the look; then there’s a load of options that can easily replace the need for them. 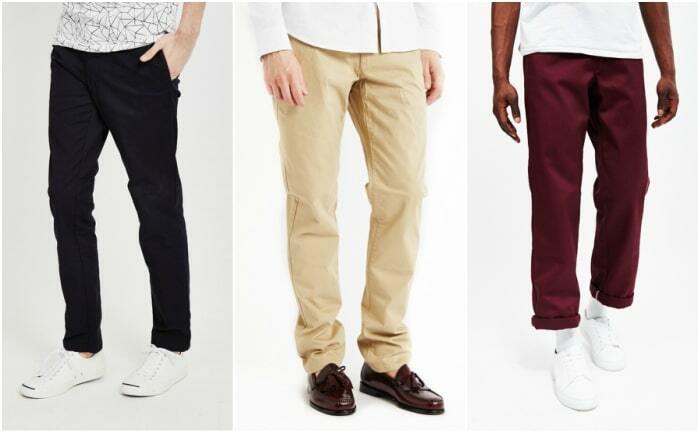 A slim fit pair of chinos or some relaxed joggers could be your new staple leg wear. And with so many ways to wear them you’ll never run out of clothing options. Previous: How do you create a Wedding Registry?